Hello and welcome to the 93rd installment of the SWD. Syrian Arab Army’s Tiger Forces captured Al-Baylunah and Jarah Saghir villages from Islamic State close to Jirah Air Base. Syrian Democratic Forces captured Al-Jaif and Abu Qira villages from Islamic State northwest of Raqqa. On the eastern axis SDF reportedly captured villages of Dahr al-Abdul and Badr with nearby Badr silos from Islamic State. According to Amaq Agency four SDF fighters were killed by a guided missile near the village of Al-Ansar which SDF captured on 12th of May. Free Syrian Army’s commander Rufaeat al-Shtioui was wounded by Hayaat Tahrir al-Sham’s fighters in Maarat al-Numaan. Islamic State once again targeted Al-Rukban (Raqban) refugee camp near the Jordanian border, this time a VBIED exploded in the camp. VBIED targeted Maghwar al-Thawra’s vehicle near the fuel station which caused a fire to spread on nearby localities. Seven people were killed in the attack and more than a dozen injured. Islamic State reportedly destroyed a pickup carrying Syrian Arab Army’s soldiers with an improvised explosive device east of Palmyra silos, another statement from Amaq stated that SAA‘s T-72 tank was destroyed with an anti-tank guided missile in the same area. Yesterday’s rebel infighting in East Ghouta killed and wounded around 80, part of these casualties are civilians caught in the crossfire between Jaysh al-Islam and Faylaq al-Rahman. Activists in East Ghouta launched a campaign for the release of nine medical personnel arrested by Faylaq al-Rahman yesterday, individuals were accused of belonging to Jaysh al-Islam and arrested at Ibn Taymiyyah checkpoint. Sham Emergency Relief Service announced suspension of its operations after Faylaq al-Rahman’s act against the aforementioned medical non-combatants. Syrian Arab Army once again tried to advance on Beit Naim front, the attack was preceded by heavy artillery shelling and both Syrian and Russian airstrikes. Jaysh al-Islam repelled the attack reportedly killing 18 SAA‘s soldiers and destroying two armored vehicles. Town of Hammouriyah was also affected by today’s shelling and airstrikes which caused more than a dozen of civilian casualties. 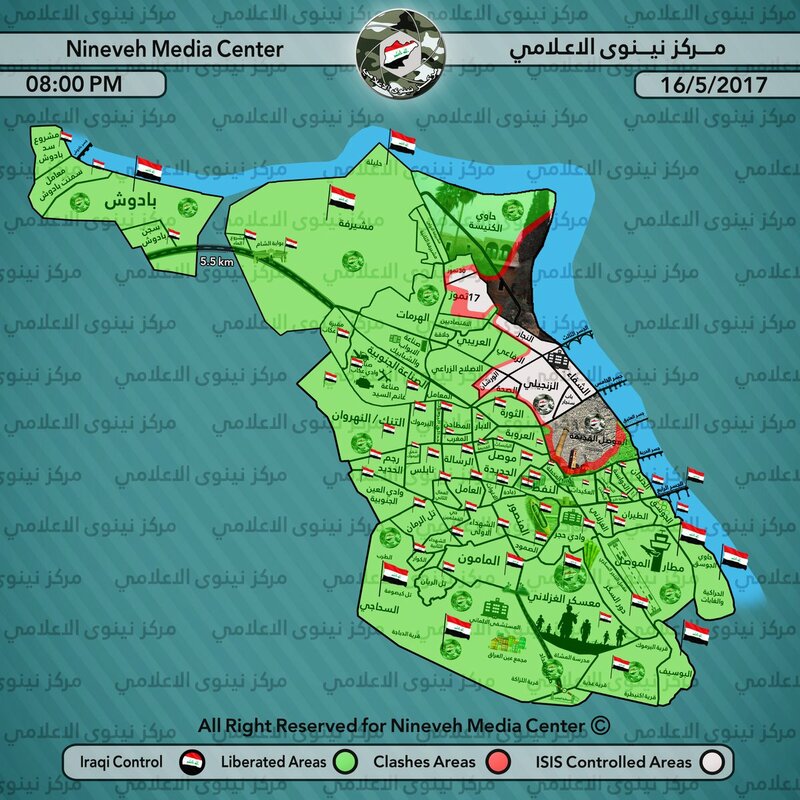 Iraqi Army launched an attack on Al-Najar district in west Mosul, if district is fully captured Islamic State will be close to being split into two pockets in Mosul. 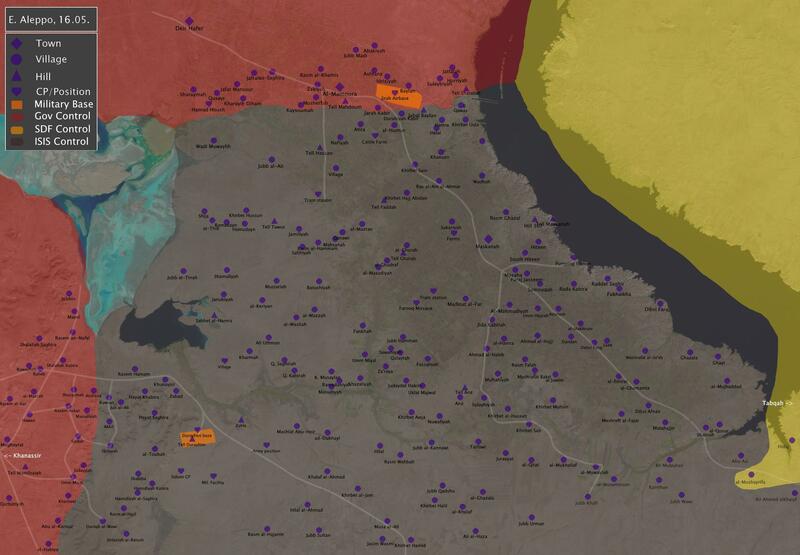 To counter this possible scenario Islamic State continues to put pressure on districts captured by the Army. In Al-Haramat district Islamic State’s SVBIED destroyed a Humvee and a BMP while the SVBIED in Al-Aerebi district destroyed a bulldozer and caused several casualties among the Army’s ranks. In Mushrifa an armored vehicle and a Humvee were destroyed by Islamic State according to Amaq. After stagnating for some time Old Mosul district front has been reactivated as Islamic State claimed its sniper killed five members of Iraqi Federal Police on the outskirts of Bab al-Toub neighborhood. Iraqi Joint Operations announced that Iraqi forces have killed 16487 Islamic State’s fighters since the Mosul operation started in October of 2016. Furthermore it was also stated that 679 SVBIEDs and 76 VBIED factories were destroyed as well as 6661 improvised explosive devices defused. Al-Hashd al-Shaabi (Popular Mobilization Units) made advances south of Al-Qayrawan capturing several villages from Islamic State such as; Tal Bashooq, Thri al-Kahar and Tal al-Thil. The only area where Islamic State is fiercely resisting is around Tal Banat which they lost on 13th of May, since then the village was struck by an SVBIED and several guided missiles. Today is no difference as Islamic State reportedly destroyed a bulldozer with a guided missile. A mass grave was found by Al-Hashd al-Shaabi west of Mosul presumably containing remains of Yazidis executed by Islamic State. Al-Hashd al-Shaabi’s commander Rifaat Ahmed Mohammad was killed yesterday in clashes with Islamic State southwest of Tal Afar in Al-Qayrawan area. The United States’ Army reportedly took control of the former Iraqi Air Force’s K-1 Air Base from Peshmerga north of Kirkuk. The reason for this handover if confirmed would have to be the security of American soldiers stationed there as the base was attacked by the Islamic State on 7th of May killing two Peshmergas. Unknown armed group took control of the “modern village project” in Al-Qurnah northwest of Basra, engineers and other individuals were physically assaulted and forced out of the village. On the 15th of May 2017 CJTF-OIR has conducted 17 strikes in Syria. CJTF-OIR‘s main focus in Syria at the moment is Tabqa-Raqqa-Deir al-Zour region where they did 15 strikes supporting SDF‘s operation against IS destroying three IS fuel trucks, two IS wellheads, an IS pump jack, three vehicles, three fighting positions and an artillery system. Other area where two strikes occurred is Abu Kamal destroying an IS pump jack and an IS wellhead. Full report on CJTF-OIR strikes conducted in both Syria & Iraq can be found here. You should make a blog for Iraq. Thank you for your input, there’s been some talk about separating Iraq into a “standalone” blog, but seeing how both wars in Syria and Iraq are interlinked and similar it was decided to have it all under one blog with Syria as main “focus”.